REBODY® PNF-Training is functional training on the basis of PNF (Proprioceptive Neuromuscular Facilitation) which is a physiotherapeutic method for improving neuromuscular coordination and motor skills through adequate stimulation of own proprioceptors. The PNF movement patterns form part of any natural movement, providing optimal biomechanics. REBODY® PNF-Training integrates the principles of PNF and creates a highly effective and safe functional training method that improves everyday life as well as the sports performance. The main features of the REBODY® PNF-Training are the effective and safe all-in-one movement patterns for improving strength, mobility, stability, coordination and flexibility as well as prevention and regeneration. Classic exercises, such as squats, push-ups, pull-ups, etc. will be redefined and optimized. No matter whether sports enthusiast or athlete, anyone can benefit from the REBODY® PNF-Training. REBODY® PNF-Training is designed for personal fitness trainers, sports coaches and physiotherapists who are looking for a new, multi-faceted, highly effective and health-oriented functional training. REBODY® PNF-Training is not a therapeutic method but provides expertise, clear methodology and effective training tools. Basic principles of neurophysiology of movement. Practicing all PNF patterns with optimal biomechanics for shoulder and hip joints. REBODY® PNF Bodyweight Training to improve coordination, endurance, mobility and stability. REBODY® PNF Strength Training with cables, elastic bands and free weights. 3D REBODY® PNF Flexibility Training. REBODY® PNF Sports Specific Training. Training planning and design for all target groups and needs. La formación consiste en 2 días repartidos en un fin de semana (Sábado y Domingo). Dr. Panos Pantas has a PhD in biochemistry and is working as a personal trainer and international presenter of functional training in Europe and Asia for more than 20 years. He is the owner of the REBODY® center in Barcelona (www.rebody.eu) for more than 9 years. 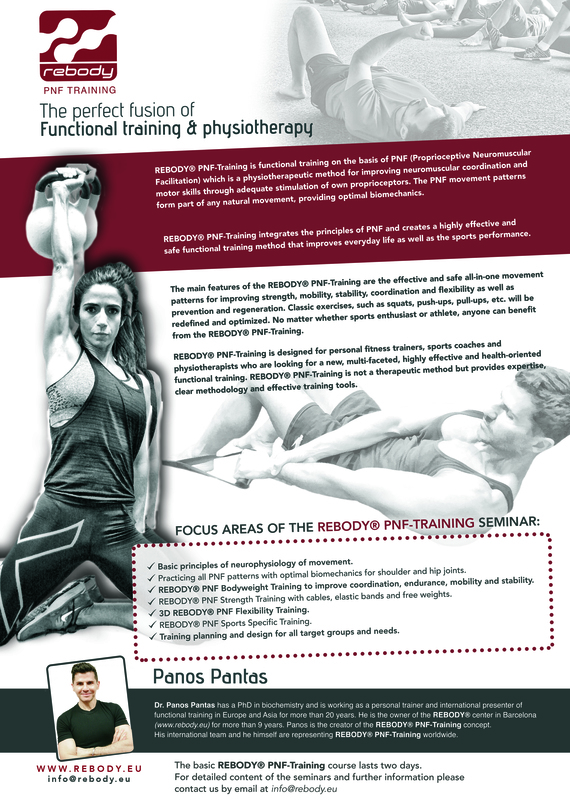 Panos is the creator of the REBODY® PNF-Training concept. His international team and he himself are representing REBODY® PNF-Training worldwide.